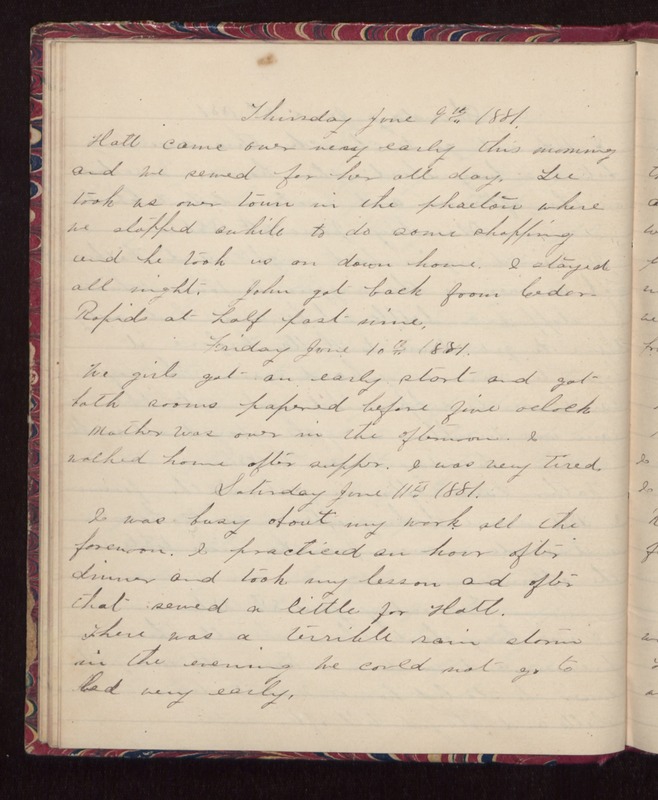 Thursday June 9th 1881. Hatt came over very early this morning and we sewed for her all day. Lee took us over town in the phaeton where we stopped awhile to do some shopping and he took us on down home. I stayed all night. John got back from Cedar Rapids at half past nine. Friday June 10th 1881. We girls got an early start and got both rooms papered before five oclock. Mother was over in the afternoon. I walked home after supper. I was very tired. Saturday June 11th 1881. I was busy about my work all the forenoon. I practiced an hour after dinner and took my lesson and after that sewed a little for Hatt. There was a terrible rain storm in the evening We could not go to bed very early.